I believe that the more you cook, the greater your awareness becomes of the foods and products you consume. Especially when contemplating the smallest ingredients of the foods you cook, your overall awareness of the whole is heightened. Think of this as food nirvana. It is through such awareness that you become more critical of what you put into your body and the bodies of your loved ones. For example, as embarrassing as it might be to admit, many years ago I used to love me some canned chili. I know, canned meaty-chili sounds awful now, but I loved it at the time. It offered the nostalgic taste of homemade chili I enjoyed as a child with the modern convenience of nuking it in the microwave. I would often bring it to work in my lunch bag, along with a sleeve of saltines for crumbling salty chards atop my chili. As I got older, I became more adventurous with my cooking. Eventually, I learned to make my own chili and eventually my own chili powders. When I think of the most minute ingredient in my homemade chili – for example, the spices – and I compare that to the most minute ingredient in the canned chili I loved in my early twenties, (e.g. preservatives, hydrolyzed soy, etc.,) I can’t help but cringe and be grateful that the days of canned chili are behind me. Furthermore, it brings to mind other food products that I consume, and forces me to think of them on a deeper, more critical level. I wouldn’t go as far to say that you should always make your spice blends, like chili or curry powders, nor would I keep you from doing so. After all, there are loads of high-quality spice blends out there. But, what I would suggest is that you start examining your foods on a deeper level by reading labels, and cooking more often. In doing so, you will start to truly appreciate real food where the most miniscule ingredients are the spices that you add, and not chemicals and preservatives. For this recipe you’ll need a coffee grinder. Some say that you should have two coffee grinders; one dedicated to coffee, and the other for spices. For me, that idea is a little extreme. I learned to clean and deodorize a coffee grinder simply by grinding a few tablespoons of rice in it, then wiping it out with a clean paper towel. The rice cleans and absorbs odors and oils left over by coffee or spices. In writing this recipe, I used the following mix of peppers not only because I like their flavors, but also because they were what I had on hand. 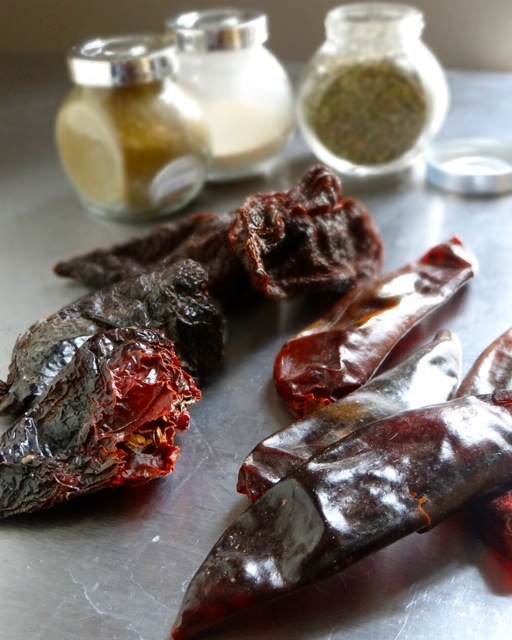 You could try dried chipotle or pablano chili peppers, if you’re lucky enough to find them. Take the liberty to experiment with whatever peppers you like, in whatever combination you choose. Heat the chili peppers over medium-high heat, in a dry sauté or frying pan for about 4-5 minutes or until fragrant. Be sure to turn them occasionally to keep them from burning. Remove them from the pan, and allow them to cool to room temperature. 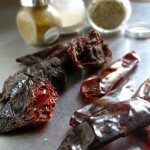 Once cooled, work in batches, and snip the chili peppers into small strips and shards into the vessel of your grinder. The smaller you snip the peppers, the easier it will be to grind them into powder form. Grind them into a powder, and then place the ground chilies into a small mixing bowl. Add the remaining ingredients, and whisk well to combine. Store in a dry container. Select your peppers. Remove the stem and the seeds. Reserve a some of the seeds if you desire. Toast the peppers in a dry pan, turning often, for about 4 minutes, or until fragrant. Once chilies have cooled, snip and pulverize. Then add into remaining ingredients.